Congratulations on Your New Puppy or Kitten! Do you have a new energetic, happy and loving new baby animal companion? If so, we can’t wait to meet your new friend, and we are certain they are absolutely adorable. Please schedule an exam with us as soon as possible so we may welcome your puppy or kitten into our family, make sure they are healthy and give you guidance and support to acclimate them into your home and life. 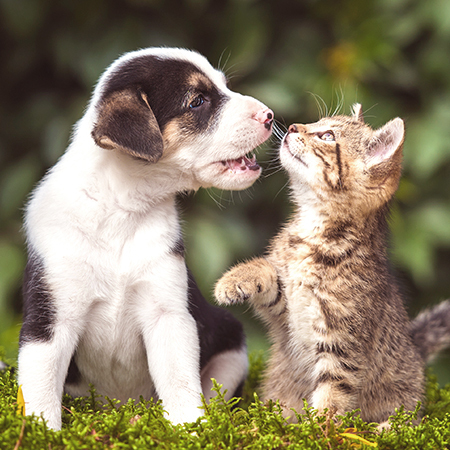 If you have not chosen your puppy or kitten yet, we are here to help you make the decision easier and can counsel you on breed selection and proper pre-planning so that you get the right pet for your environment and lifestyle. Your baby animal’s initial exam with us is the first step you can take to be sure your wonderful new companion grows up strong, healthy and happy. Veterinary care is essential throughout your little buddy’s entire life and starting a relationship with us early is the best opportunity to provide longevity for your pet. During their first exam, we encourage you to ask us any and all questions you may have about your new best friend, including health issues, behavior issues, house training, necessary immunizations, environmental enrichment, exercise, nutrition and the anticipated lifestyle of your puppy or kitten. To schedule an exam, or if you have any questions, call us at 907-268-3379 or make an appointment online.